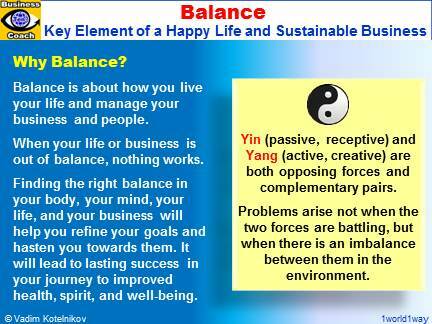 Balance is a continuous process. As you or your business evolve you’ll find new ways to integrate the different aspects of your life and business into a whole. Your life can only be in balance when giving and receiving are in balance. Every interpersonal relationship is built on this fact of life. He who always gives acts against this principle just as much as he who only takes. This basic truth is valid without exception everywhere where people deal with people. Balance isn’t an issue of time, but an issue of choice. It’s about living your values by aligning your behavior with what you believe is really important. Maturity is the balance between courage and consideration. The purpose of Feng Shui is to balance the flow of energy in your immediate environment to promote harmony, happiness, and success. Intuitive management is about making the right decisions at the right time through integrating and balancing left (analytical) and right (creative) brain management skills. Finding a balance between your investment needs, strategic goals, and tolerance for risk is essential.